All users of bouncy castles should not be taller than the inside walls from the bouncy bed and this is for health and safety purposes so every bouncy castle owner should be fully aware of this and also advising customers of this when hiring it out. Generally we advise customers to have a disclaimer highlighting all health and safety points for the customer to sign before you leave the bouncy castle with them. 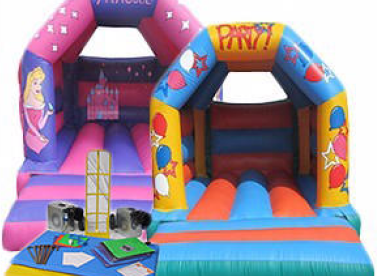 We do provide two sample disclaimers that can be used in our business guide which comes absolutely FREE with every bouncy castle and inflatable. However with Premier Inflate Bouncy castles we are always trying to improve them for the user and make them more health and safety conscious and so with all our A Frame Bouncy Castles we fully attach the rain cover to the side walls and have back wall netting/rain cover which eliminates the risk of users being able to climb on the walls / fall out and therefore this means the height of the user is not restricted. Premier Inflate are always trying to think of innovative new ways we can change our bouncy castles to improve the design or functionality of them but if you have any suggestions please feel free to contact us we are always grateful of customer feedback. How Heavy is a Bouncy Castle?